Richard Mally and other authors published a paper in 2015 on a study of African moths whose larvae feed internally in fruit of Solanaceae. They discovered seven previously unknown species, but also concluded that the genus Sceliodes was synonymous with Leucinodes. They used evidence based on morphological characters and a study of mitochondrial DNA. Species of Leucinodes are found in Africa, Asia and Australasia. 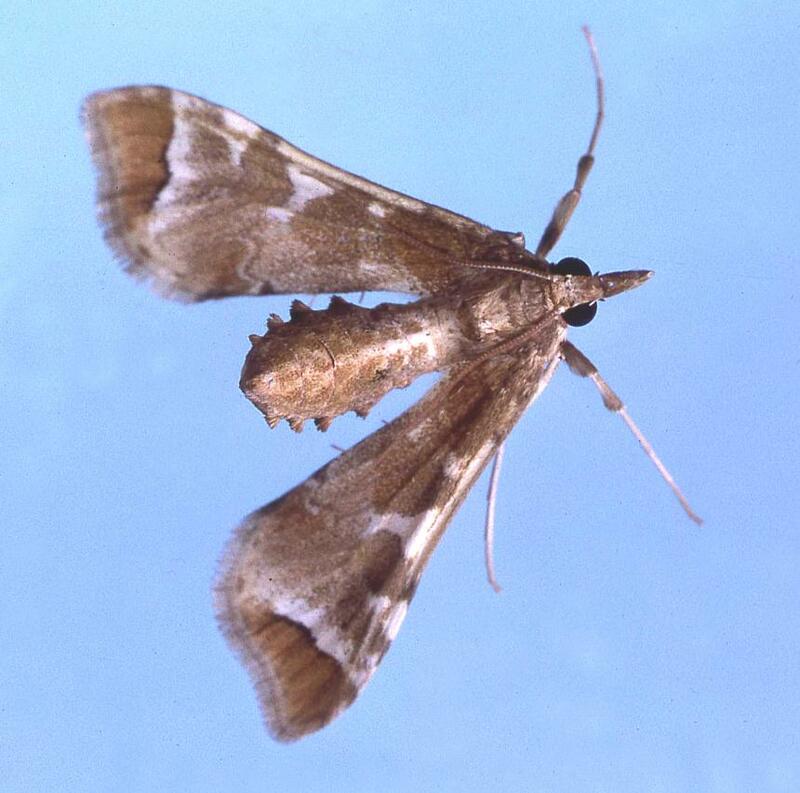 This native moth is found in New Zealand and mainland Australia where it’s two main native host plants, Solanum aviculare and S. laciniatum, occur. In New Zealand it is present throughout the North Island. In the South Island it is present in Nelson and Marlborough, and in coastal or near coastal areas of the Canterbury and Otago down to Dunedin. 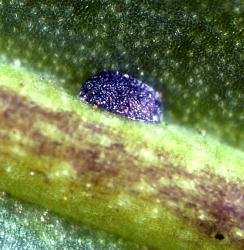 Conservation status: Widespread, not threatened, a minor pest of some crops. 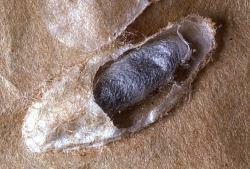 The insect overwinters as a caterpillar in a cocoon. This winter rest is called diapause. 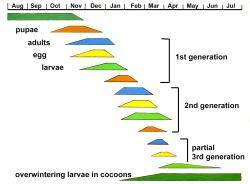 In the spring the larvae pupate, and moths emerge in November and December. The adult moths have distinctive pale brown triangular wings and hold their abdomens curled up in a distinctive manner. The newly emerged female moth emits a pheromone (a mixture of volatile chemicals) that attracts male moths. 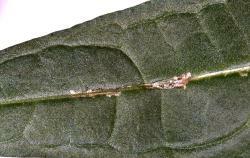 After mating, female moths lay white eggs either on green fruit by the calyx or on the underside of leaves by the midrib. During egg-laying, the ovipositor is moved over the leaf or fruit surface. 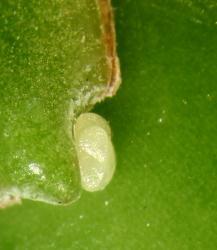 When it touches a suitable crevice, one or more eggs are laid. The eggs turn red after 1-2 days. 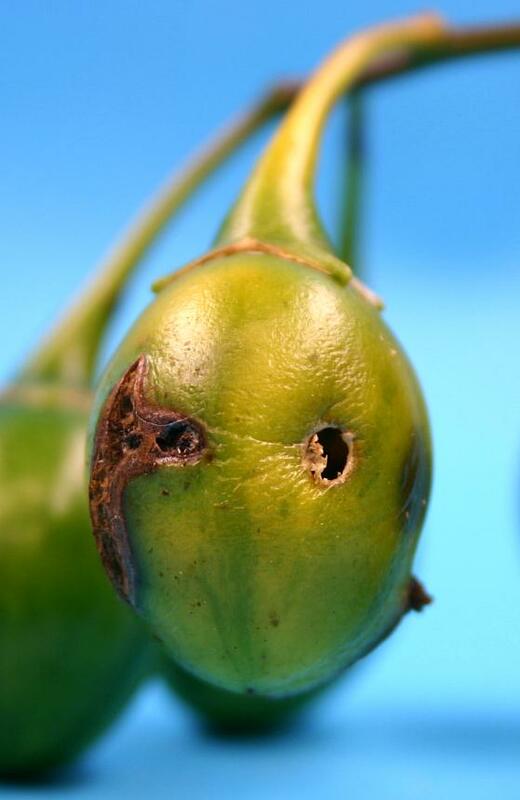 Caterpillars hatching from eggs on fruit crawl over the fruit before chewing a hole in the skin. They then tunnel just below the skin. Older caterpillars burrow into the centre of the fruit and feed on the developing seeds. 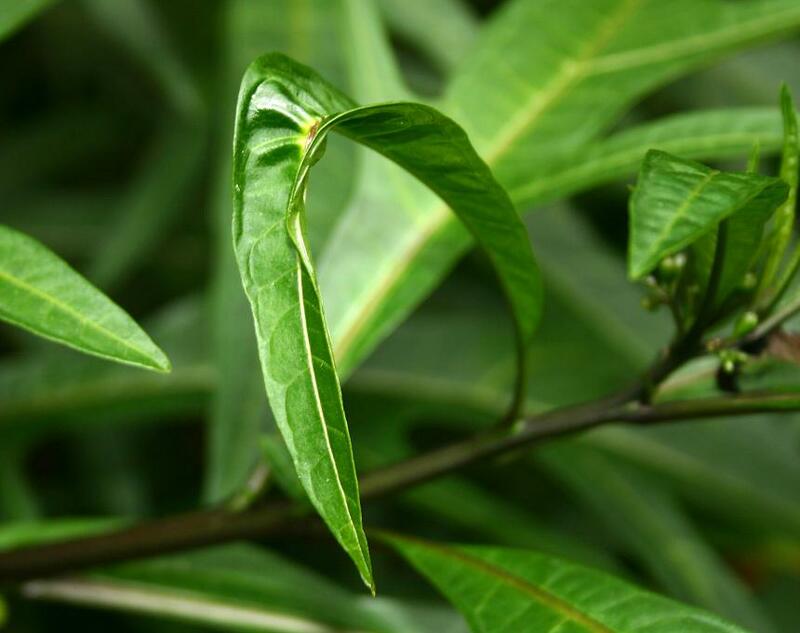 Caterpillars from eggs laid on leaves, either crawl to a nearby fruit or burrow into the midrib of the leaf. 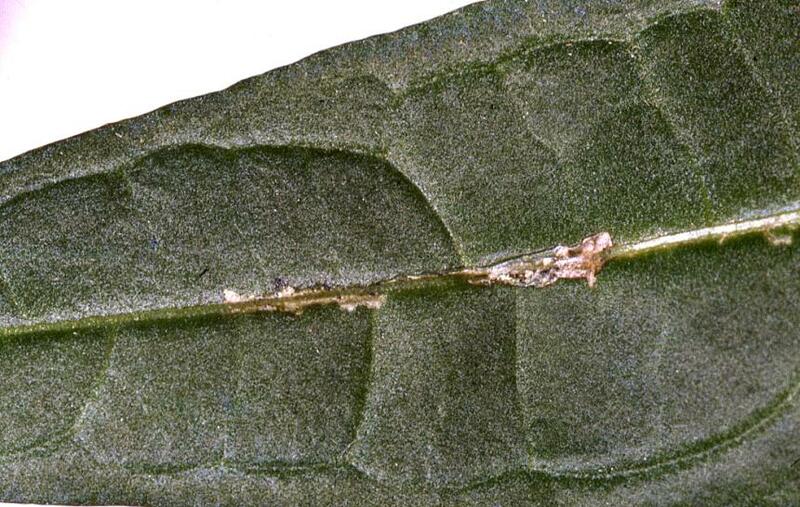 These caterpillars later leave the leaf and burrow into the shoot. 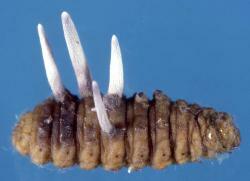 The caterpillar moults (changes its skin) five or six times. 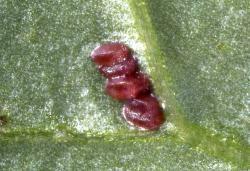 When fully grown, and just before leaving the fruit or shoot, the caterpillar turns red. The caterpillar comes out only at night and presumably its red colour makes it more difficult for predators to see. 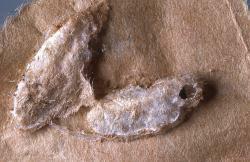 The caterpillar finds a crevice and spins a cocoon, which it covers with any debris from its immediate surrounds, e.g. lichen, decayed wood, paint, making it very difficult to find. The caterpillar turns white and after a few days, pupates. Seven to ten days later, an adult moth emerges. There are usually two generations per year. 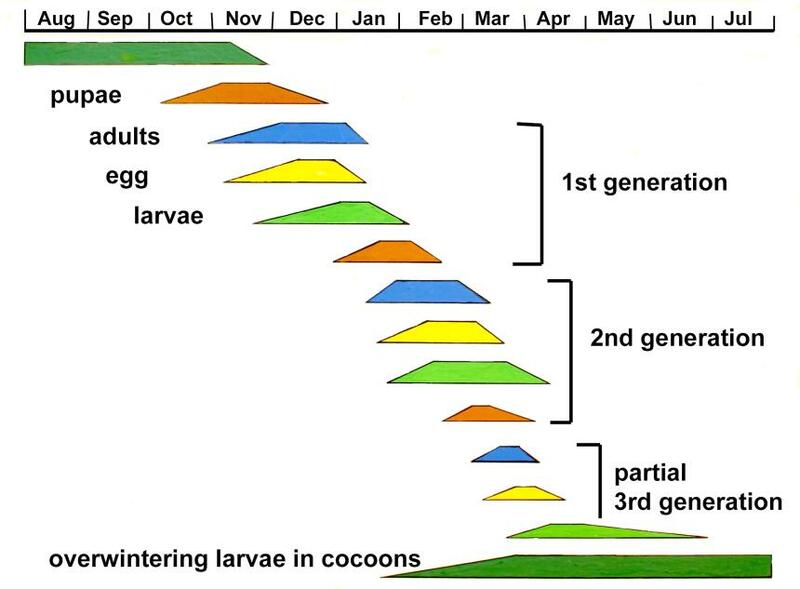 Caterpillars forming cocoons from mid to late February onwards stay as larvae until the following spring. The moth’s distinctive wing shape and colour pattern, plus the upturned abdomen, provide strong indicators of this moth’s identity. There are, however, other moths with similarly shaped wings that also have an upturned abdomen, so some caution is needed when identifying the moths. The damage caused by the caterpillars to their native host plants enables their identification. 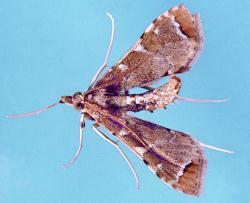 The presence of shoot-boring caterpillars and red caterpillars in fruit of capsicums, eggplant fruit and pepinos is also characteristic of this species of moth. Birds such as silvereyes can attack cocoons if they find them. They will eat the overwintering caterpillars and pupae. 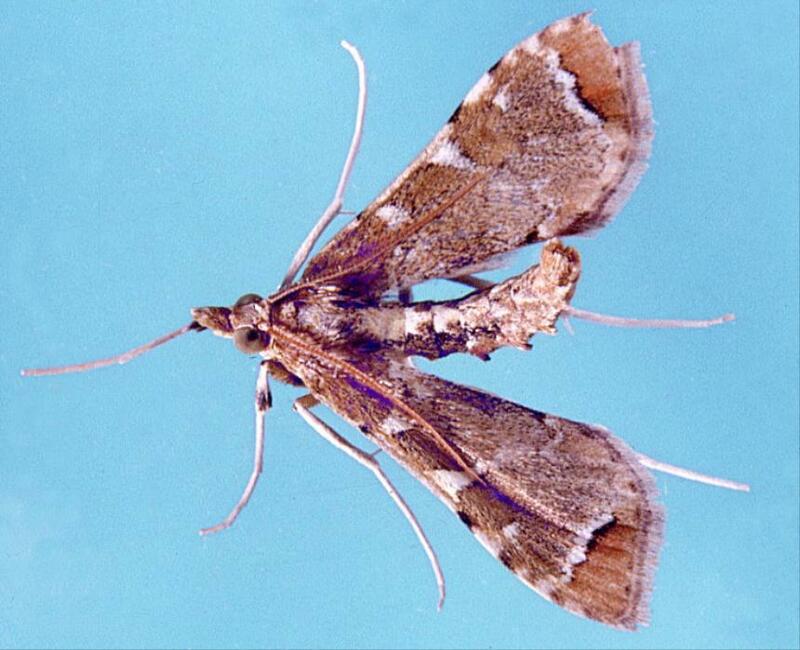 Spiders may catch and eat the adult moths. 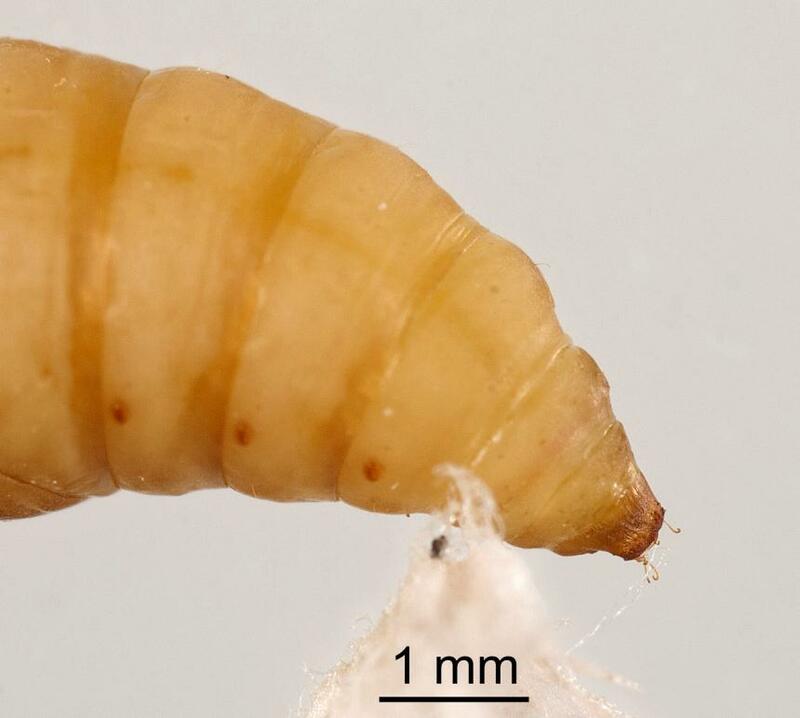 The tiny neonate caterpillars may be eaten by predatory insects or mites and the mature caterpillars may be caught and eaten by birds and insect predators. At least four species of Hymenoptera (wasps) are parasitoids of the egg and caterpillar stages. At least two species of egg parasitoid have been found; both belong to the family Trichogrammatidae. 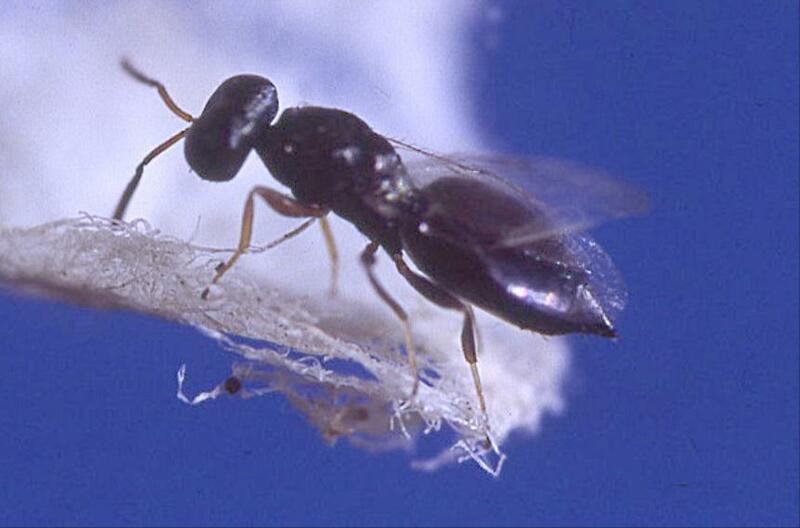 One egg parasitoid, Trichogrammatoidea sp., turns the moth egg black, which makes it easier for humans to find. 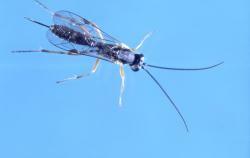 A parasitoid, belonging to the family Ichneumonidae, lives in larvae while they burrow in the plant. 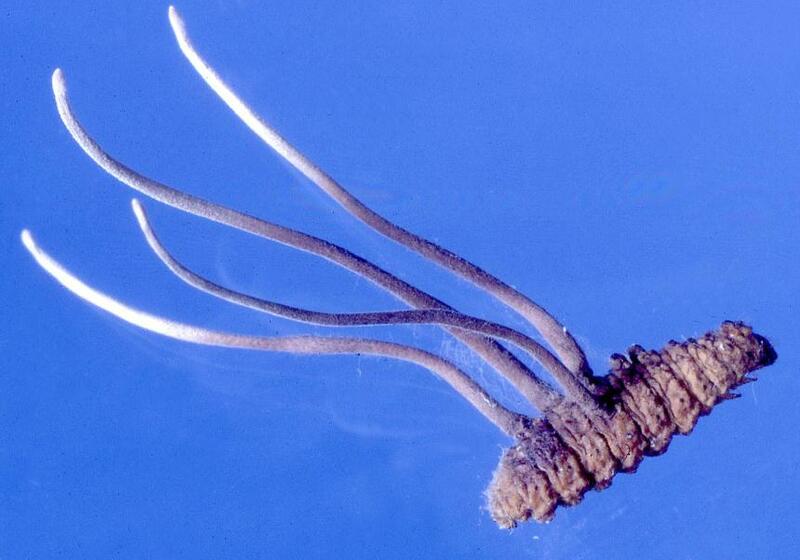 The female has a long ovipositor that presumably helps it to lay an egg in the larva in the plant. The caterpillar containing the parasitoid larva makes a normal cocoon, but is then killed by the parasitoid, which spins its own cocoon in which it pupates. 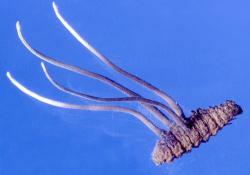 The adult ichneumonid chews a hole through both cocoons in order to emerge. 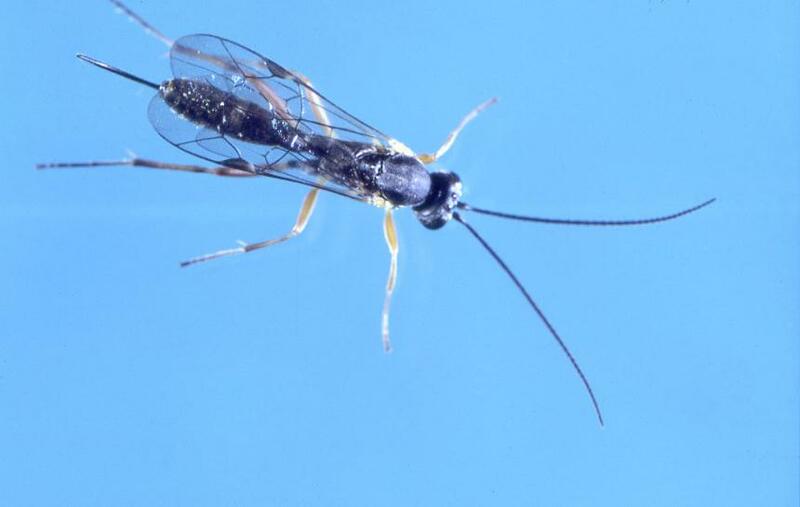 Another wasp parasitoid belongs to the family Pteromalidae. 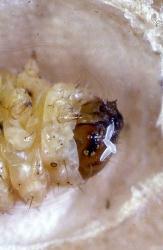 The female stings the caterpillar in its cocoon and lays eggs alongside the caterpillar. 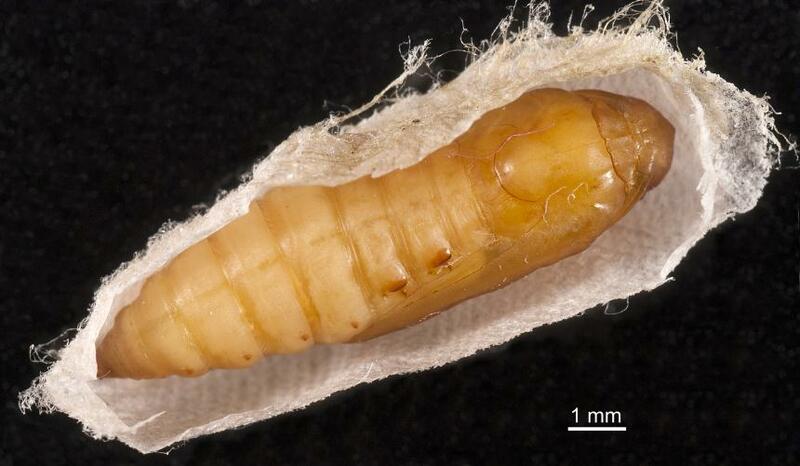 The white parasitoid larvae feed on the caterpillar, which shrinks; when the parasitoid larvae are fully grown, they pupate in the caterpillar cocoon. 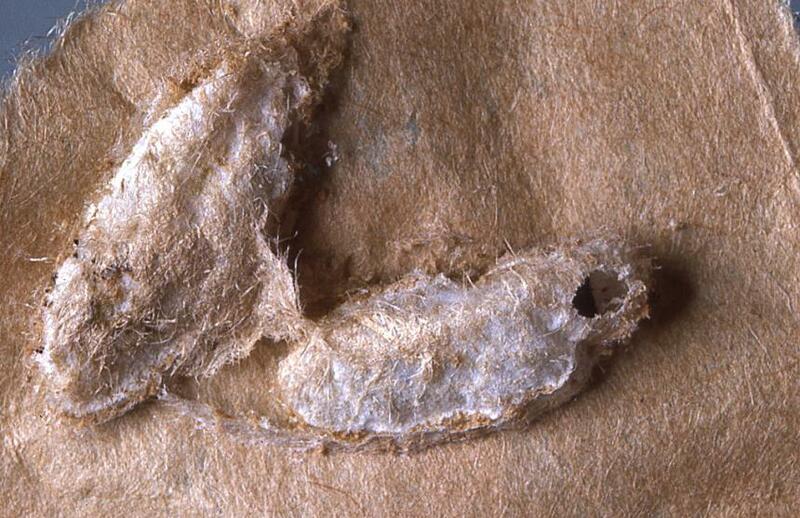 When the adults emerge, they chew holes in the cocoon to escape. 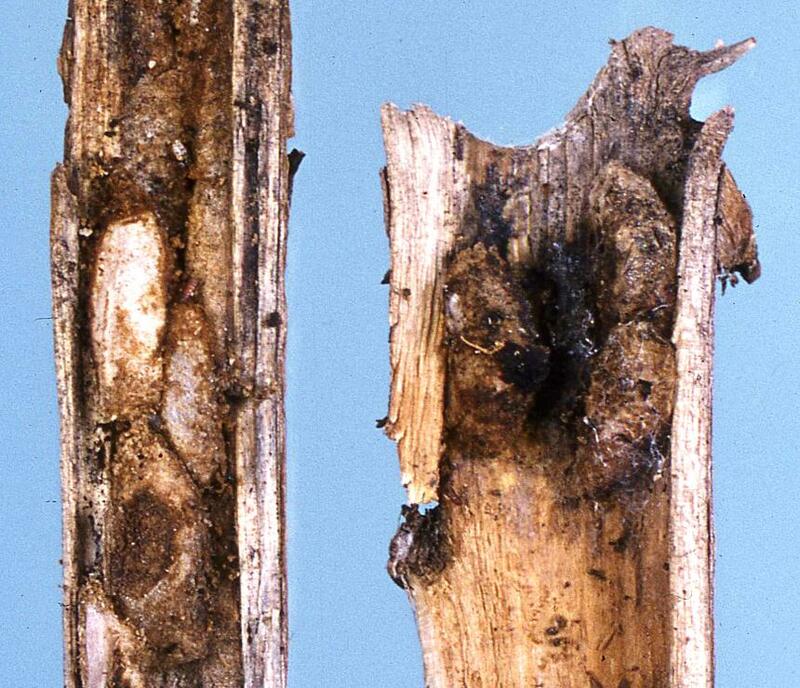 Several insect pathogenic fungi have been found infesting pre-pupal larva. One form of the fungus, Cordiceps, produces long fruiting bodies while other forms of the fungus covers the insects with white mycelium. 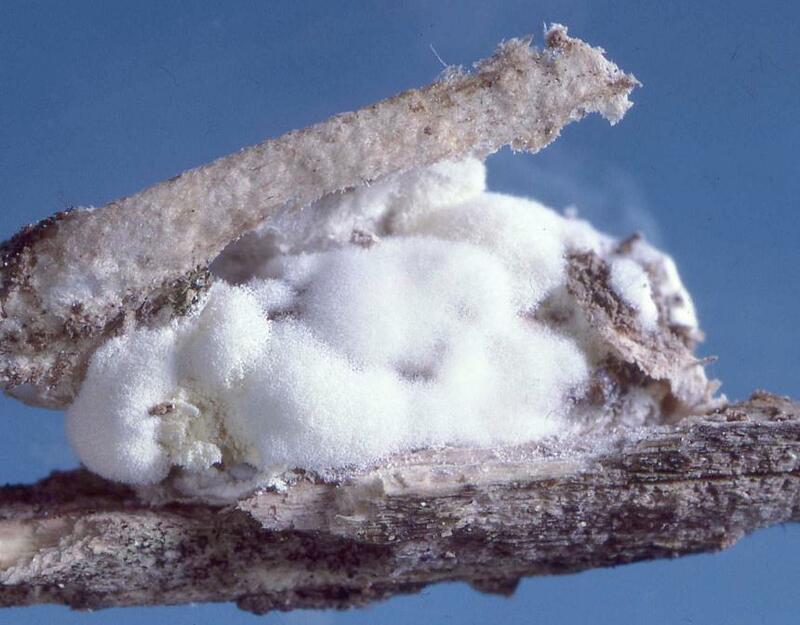 Two Hyphomycete fungus (Hirsutella subulata Petch and Metarhizium anisopliae (Metschn.) Sorokin), a microsporidian fungus (Nosema sp. ), and two viruses a nuclear polyhedrosis virus and a Cytoplasmic polyhedrosis virus, have also been found infecting caterpillars. Table: Natural enemies of Poroporo fruit borer, Leucinodes cordalis (Lepidoptera: Crambidae), from Plant-SyNZ database (5 June 2015). The reliability index shows the quality of evidence for the host association (0-10, 10=high quality). Host plants all belong to the family Solanaceae. 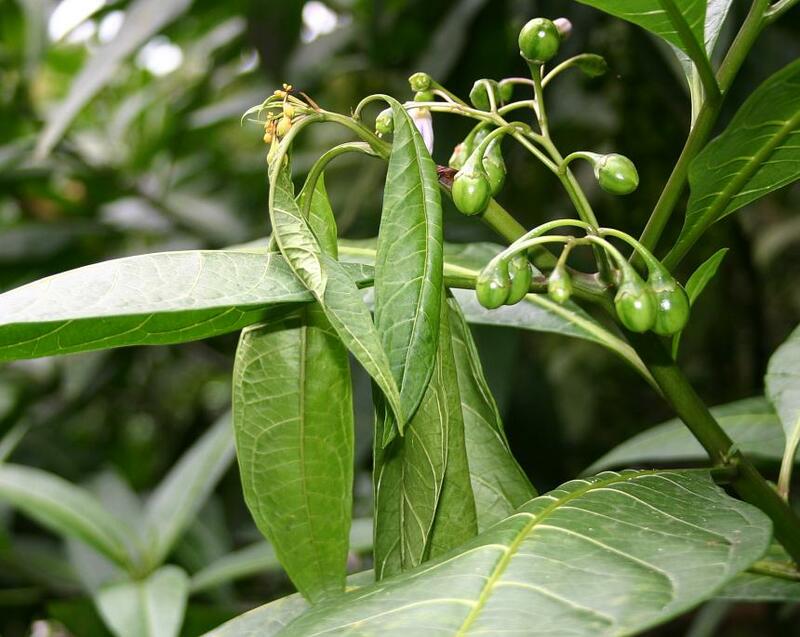 They include two native species, Solanum aviculare and S. laciniatum, which are often called poroporo. Other plants that are attacked in New Zealand and Australia included the crops, capsicum (Capsicum fructescens), eggplant, (S. melongena) and pepino (S. muricatum) and the weed, Apple of Sodom (S. linnaeanum). 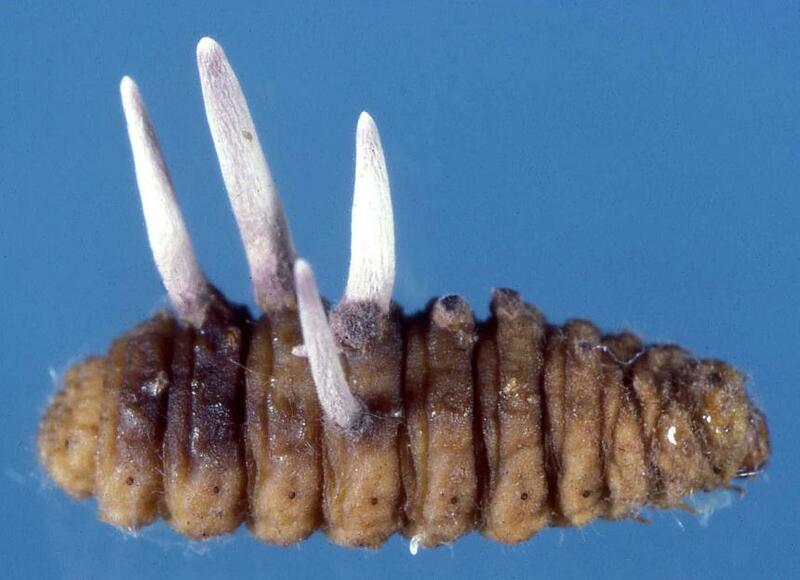 Caterpillars of this moth bore into the midrib of leaves, shoots and fruits. 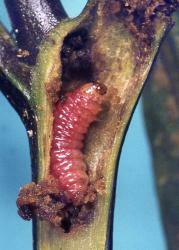 Leaves may wilt after the newly hatched (neonate) caterpillar invades the mid rib. Shoots may similarly wilt and young leaves die after the caterpillar bores into stems. When the neonate caterpillar burrows into a green fruit, it first tunnels just under the skin forming a mine visible on the outside. 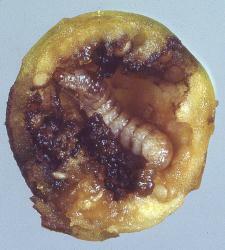 The older caterpillar burrows deep into the fruit and feeds on the developing seeds. Table: Host plants of the Poroporo fruit borer, Leucinodes cordalis (Lepidoptera: Crambidae) from Plant-SyNZ database (5 June 2015). The reliability score shows the quality of evidence for the host association (1-10, 10=high). In the late 1970s, poroporo was grown on a large scale in Taranaki for the extraction of a precursor for the manufacture of pharmaceutical steroids. 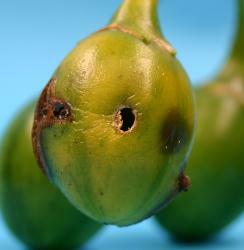 The poroporo fruit borer damaged some of the green shoots that were being harvested. 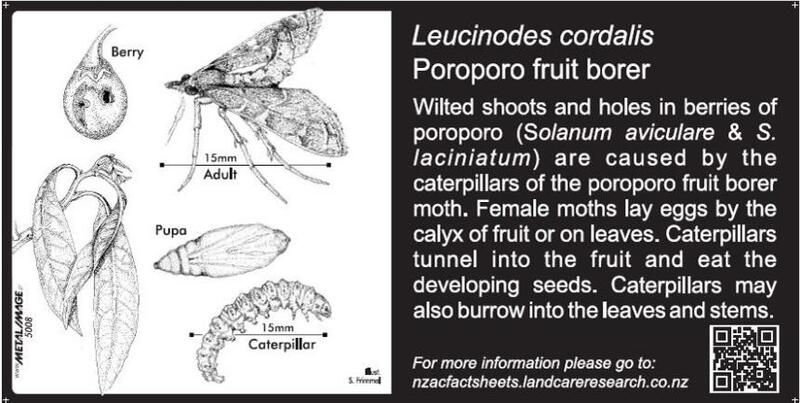 This led to research on the biology and control of the insect, which in turn resulted in most of the information and photographs used in this factsheet. Signs for the Poroporo fruit borer are best placed by a poroporo bush of either species. The bush will live for several years. After it has died, another could be planted near the sign, or the sign moved. Clearwater JR, Galbreath RA, Benn MH 1986. 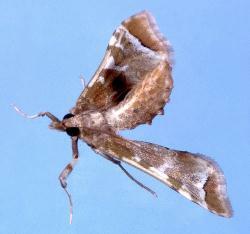 Female-produced sexual pheromone of Sceliodes cordalis (Lepidoptera: Pyralidae). Journal of Chemical Ecology 12(9): 1943-1964. Dhana SD 1984. 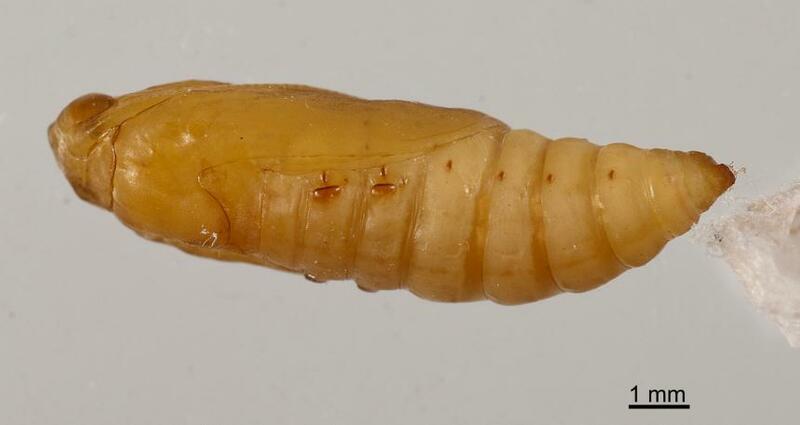 A nuclear polyhedrosis virus of the poroporo stem borer, Sceliodes cordalis (Lepidoptera: Pyralidae). New Zealand Entomologist 8: 67-68. Mally R, Korycinska A, Agassiz DJL, Hall J, Hodgetts J, Nuss M. 2015. 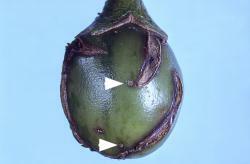 Discovery of an unknown diversity of Leucinodes species damaging Solanaceae fruits in sub-Saharan Africa and moving in trade (Insecta, Lepidoptera, Pyraloidea). ZooKeys 472: 117-162. Martin NA 1999. Arthropods and molluscs associated with poroporo (Solanum aviculare and S. laciniatum): an annotated species list. Journal of the Royal Society of New Zealand 29: 65-76. Mercer CF, Wigley PJ 1987. 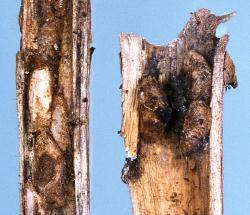 A microsporidian pathogen of the poroporo stem borer, Sceliodes cordalis (Dbld) (Lepidoptera: Pyralidae) : I. Description and identification. Journal of Invertebrate Pathology 49(1): 93-101. Thanks to Chris Mercer for information about the fungal pathogens. Thanks to Eric Scott for helpful suggestions. The New Zealand Plant & Food Research Institute Ltd (Plant & Food Research) for permission to use photographs. 1 August 2017. NA Martin. The scientific name changed from Sceliodes cordalis to Leucinodes cordalis. 5 June 2015. NA Martin. Added additional synonyms. Distribution: changed. Life stages: added photo of pupa. Recognition: added photographs. Natural enemy table added and information updated. Host plants: added photos of damage. Details of Bug Signs added. Martin, NA. 2010, revised 2018. Poroporo fruit borer - Leucinodes cordalis. Interesting Insects and other Invertebrates. 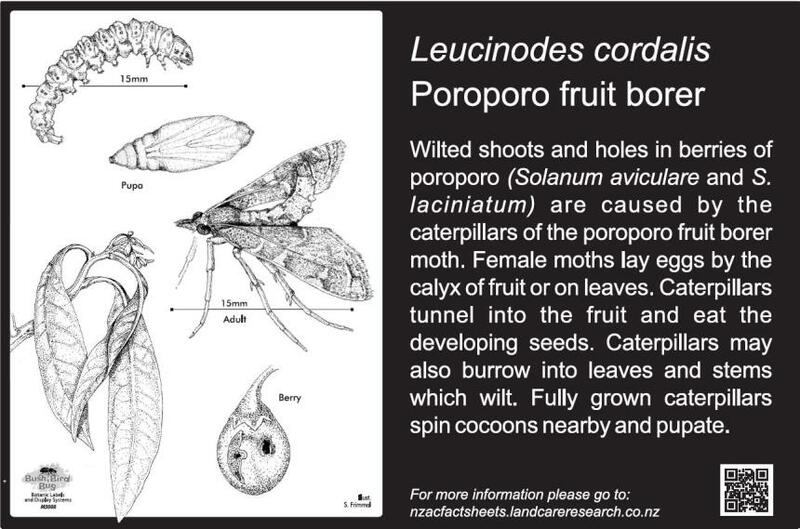 New Zealand Arthropod Factsheet Series Number 10. http://nzacfactsheets.landcareresearch.co.nz/Index.html. Date Accessed. ISSN 1179-643X.